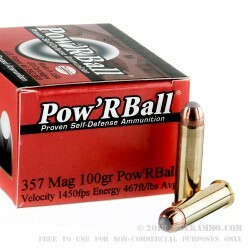 Need a quick moving round for your .357 Magnum? Corbon’s PowR’Ball round is designed to provide reliable feeding in even the fussiest pistols, with a hollow point that functions like ball ammo. 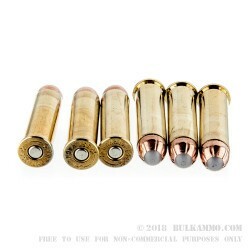 These .357 Magnum rounds are loaded with a 100-grain Glaser PowR’Ball projectile into boxer-primed, noncorrosive, nickel plated reloadable brass cases and are capable of a muzzle velocity of 1450 FPS. 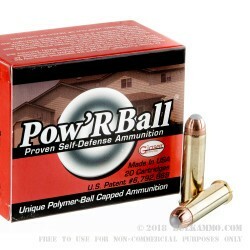 Utilizing a polymer ball that is placed in the bullet cavity and crimped into place, the PowR’Ball line not only provides reliable feeding, but allows for controlled expansion after impact, with better penetration and maximal weight retention. It delivers better penetration due to the polymer ball keeping the hollow point from being clogged and due to delayed expansion upon impact for more control, while the V-shaped lead core initiates expansion after penetration. These lightweight rounds also feature a scored jacket and less recoil than a standard .357 Magnum round due to the lighter-grain weight projectile and are ideal for self-defense. Each box contains 20 rounds of .357 Magnum ammunition. For more than 33 years, Corbon Ammunition has been a family-owned, American business. 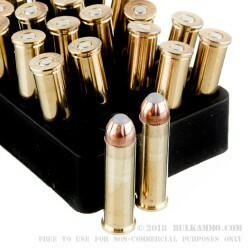 Manufacturing quality ammunition for self-defense, law enforcement and hunting applications, they have forged a reputation for great quality control and customer service.